Gold is seen as the traditional option for jewellery. Most cultures see gold as a precious material to be coveted and admire, just think of sporting medals – everyone aims for gold! Alchemists of the middle ages dreamt of transforming base metals into gold; kings and emperors fought over it; the ancient Egyptians reserved it only for Kings – no other metal has transfixed and inspired us as much as gold. Its chemical symbol, Au, is short for the Latin word for gold, ‘Aurum’, which literally means ‘Glowing Dawn’. This is appropriate as gold in its natural form is yellow in colour. It looks like the image above when it is mined. I hear countless myths and misconceptions about gold, which I hope to put to bed in this blog. Read to on to shed light on the facts about this fascinating precious metal to help you make an informed decision that is right for the look you want at a cost that is comfortable for you. 9 or 18ct? 375, 750? What does it all mean? First and foremost, let’s look at the makeup of gold used in jewellery in the UK. When you buy gold jewellery, it is not pure gold. You’ll notice that there are different carats available and that these come with widely varying price tags! Jewellers discuss the quality of the gold by discussing it terms of 24 parts or carats – shortened to ct, so for example 18ct or 9ct. Pure gold, or 24ct gold, is very soft and not deemed suitable for jewellery. 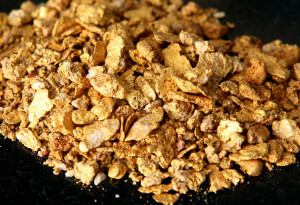 Greater durability is achieved by mixing 24ct gold with other metals to form an alloy. This is also how different coloured golds are created, as depicted in the image above. The colour differences are subtle and can only best be understood by comparing them side by side in the flesh. 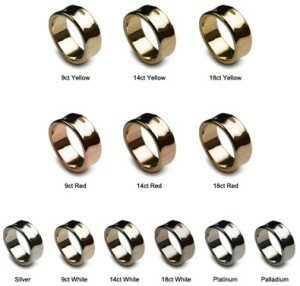 9ct gold, whether white, rose or yellow, has 9 parts out of 24 pure gold. The other 15 parts are made up of other metals such as silver, copper and palladium. The metals it is mixed with determines the colour it appears. This composition equates to 37.5% pure gold which is why 9ct gold is hallmarked with the number 375 (375 parts out of 1000). The classic choice, yellow gold has a timeless appeal. Ask a child to draw a wedding ring and they’re likely to draw a yellow band. Yellow gold is true to its natural beginnings and how it looks fresh out of the ground – gold is yellow! Yellow gold looks fantastic with white stones like diamonds as it contrasts them. It also works well with warm coloured stones for a fiery look or as a bold contrast to cool coloured stones. As you can see in the image above, 9ct yellow gold has a paler, more subtle yellow hue than the brighter, bolder 18ct yellow gold. Although price tag plays an obvious part in deciding on a metal for a piece of jewellery, but it’s also worth comparing how different carats compliment your skin tone and the colour of any gemstones included in the design. Whether you know it as red, pink or rose gold, I am so pleased to see it gaining popularity in recent years as an alternative to white metals and yellow gold. Look in any high street jeweller’s window and you’re sure to see an ever increasing range of rose gold available. Its rich coppery tones compliment most skin tones and work with all colours of stones. Like yellow gold, rose gold contrasts beautifully against diamonds while complimenting autumnal inspired designs. It can also provide a beautiful contrast to purple, blue or green stones. Rose gold gets its colour from the copper the pure yellow gold is mixed with. 9ct gold has 9 parts pure gold mixed with 15 parts of other metals (mostly copper). 18ct rose gold is much closer visually to yellow gold as it has double the amount of ‘pure’ gold it in its makeup. So if you love the coppery look, go for 9ct but if you want a more subtle variation from yellow gold, opt for 18ct. Now white gold is the subject of the majority of confusion surrounding gold. 9ct white gold has a pale creamy hue whereas 18ct white gold has a darker, almost gun metal tone. I hear people talking about white gold ‘tarnishing’ or needing ‘dipping’; let’s make it clear – gold does not tarnish like silver and copper. I believe that the main source of this confusion has come from the high street; the majority of high street jewellers plate white gold with rhodium (a metal in the same family of metals as platinum and palladium) which makes white gold look the same bright, cold white as platinum. To plate metal is to apply a microns thick layer or coating to the metal through a chemical process. This gives gold an appearance closer to the bright, cold white of platinum. What people often assume is tarnishing is where plating has worn away, revealing the true, natural colour of white gold. Plating is not a permanent colour change but a thin coating which will wear over time. Don’t get me wrong, Plating has its place in the jewellery industry, for example to modernise an inherited piece of jewellery. But it is bad for the environment as nasty chemicals are used – cyanide no less! Personally, I believe that materials look, wear and age best when in their natural state. Prior to palladium being hallmarked, white gold seemed to be viewed as platinum’s poor relation; if you’re your bank balance could not cope with the weight of platinum (no pun intended) but wanted a white metal, you’d opt for white gold. What a shame this is! The natural colour of white gold should be appreciated and understood! I even heard some people snubbing white gold as they believed it was yellow gold covered in a thin layer of platinum… Consumers are generally not given the correct information, nor were they given the opportunity to view the beautiful natural tone of white gold without the layer of rhodium. Now that palladium jewellery is increasingly popular and at a price point similar to 18ct white gold, to me, it makes no sense at all to plate white gold when it should be appreciated for its natural beauty. You can find more information about this on my White Metal blog and I’ll get off my soap box for now! Cost wise, white gold is more expensive than yellow gold as the alloys used to produce the white colour are more expensive due to their scarcity. White gold was brought into vogue in the 1920s so can be seen as a more modern option in comparison to yellow gold. However I do think the tides are turning as people are beginning to want a change from white metal jewellery. Many people may not be aware but gold can be made to appear blue, black, purple and green as well as yellow, white and pink! None is more valid or ‘pure’ than another, the colour is simply altered by changing the other metals the pure gold is mixed with. Gold remains to be a popular choice for jewellery, even with high street jewellers offering a variety of other options such as platinum, palladium and titanium. What gold offers ahead of platinum and palladium is a rich wealth of history, tradition, symbolism, value and mystic as well as multiple colour choices.